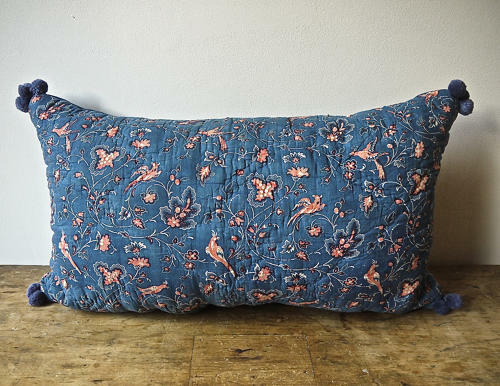 French early 19th century circa 1800-10 cushion blockprinted indigo resistwith pretty faded red birds and flowers on a soft quilted cotton.With vintage French cotton bobbles on each corner.Backed in a hand-dyed with natural indigo 19th century Frenchlinen and slip-stitched closed with a duck feather insert. There is an original seam going down the middle of the cushion but this does not detract from the piece. In good condition with wear cosistent to its age and use.